"I love chips and dip; but not all of the fat and calories. I whipped this dip up one day, and had to share it. Prep time may be reduced by mincing the pickles and onion in a mini food chopper. 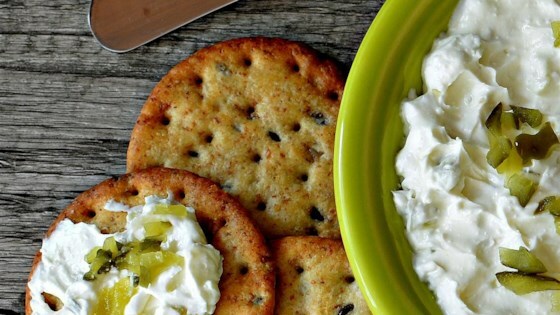 Enjoy this with low-fat crackers, chips, or vegetables!" Mix cream cheese and pickle juice together in a bowl until smooth. Add dill pickles, onion, and salt; mix well. Chill until flavors blend, at least 1 hour. We were going to a trivia night and wanted a lo-cal dip. we doubled the pickles and onion and served with pretzels and celery. Everyone loved it. I didn't use anything lower in fat. Used 4tbls of juice and onion salt (had no onion)...and it turned out great! This I e is a keeper.